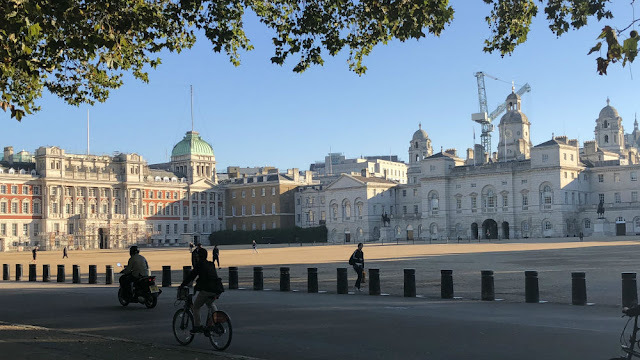 I feel very lucky that I can walk to LSE, which gives me time to prepare for the day, listen to the many podcasts I download each week and to just reflect on life. This week was mainly about familiarising ourselves with the LSE. There were many different welcome talks, tours of the Library and Campus, and sessions to help setting up our IT accounts. We have three different accounts, each with a different username and login. These accounts give us access to a range of 7 different systems, which was confusing initially but I am getting used to them. It was good to spend some time with my fellow postgrad students and to share notes and questions. We also use Messenger extensively to ask questions and communicate. The introductory presentations were useful and so much better than anything I recall back in my time. It was good to see they included a video on informed consent. It did make me feel for women back in the late seventies and eighties, who I suspect encountered a lot of unwanted attention. This week we had to choose our modules via an online system, which caused a little tension as some courses are capped. In addition to my mandatory courses I have opted for courses on political communication, critical issues in media and journalism, and mediated resistance and activism. The essay questions for most of the courses are already available on the Moodle learning platform. My first formative essay is due to be submitted in five weeks. So suddenly it all feels very real. What has been reassuring is the degree of support available with a wide range of workshops covering how to take notes, read critically, write academic essays, etc., and many workshops on undertaking a dissertation. I have booked a number of these already, as it is some time since I have written an essay. We also met our academic tutor this week and I was delighted to get allocated Charlie Beckett, who runs Polis, the LSE's media think-tank. Unfortunately he is a West Ham fan but then no one is perfect. This week was also Freshers Week and there was a lot of social activity and an open day for the wide range of University societies. I skipped the Post Grad welcome party at a London Club but I did sign up for a range of the societies, as I thought this might help me meet and engage more socially with other students. So far I have joined the entrepreneurs society, the PPE society, the TEDx society, the mature students society, and the Labour and Co-operative society (I am keen to get stuck into some political discussion and observe political communication strategies). I was thinking of joining the salsa society but the hips won't lie. I have also joined the student gym and the table tennis club to stay fit. I know, that seems a lot but I thought I would start optimistically. 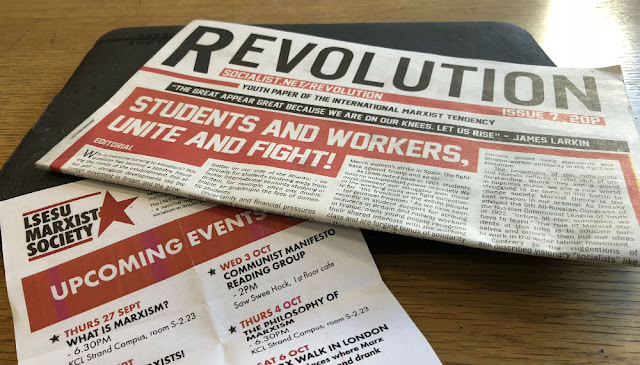 I was encouraged to see there are still active Marxist societies and a paper called Revolution. Thirty five years ago I may have signed up, this time I just took the paper with a wry smile. I think the headline is actually the exact same headline I recall from thirty five years ago. I joined up as student using an app called Totum. My official student ID is held in a wallet in the app along with my Totum card which provides a range of student discounts. My first purchase with a student discount was renewing my annual subscription for the Financial Times. There is also an official Student Hub app which is new at LSE this year. I was sceptical. It seems like everyone has to have an app these days. I shouldn't have been. 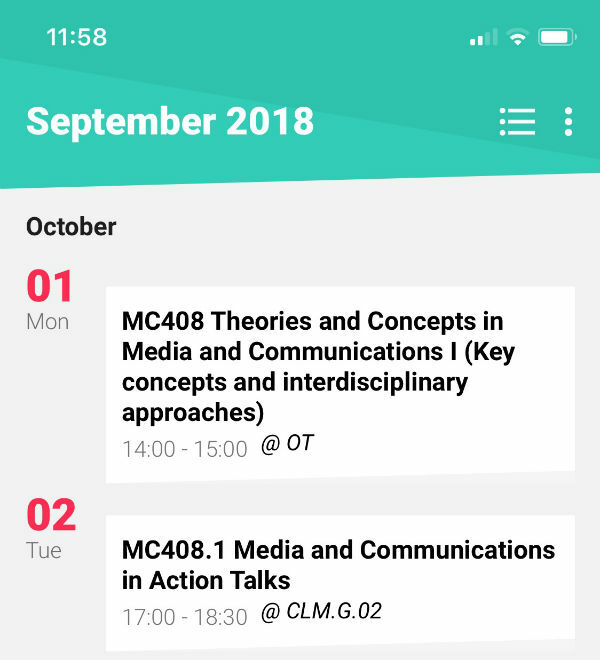 The app is really useful and it is particularly impressive that it automatically populates your calendar with your lecture timetable (see below). There are no longer any excuses for missing lectures. Overall the first week has been much busier than I expected. It was a little overwhelming initially and I can see why the University allows a full week for orientation. I am not sure if it was any different being a mature student. I may have benefited from being IT literate and being familiar with many of the systems. For example, in a previous company we installed and customised Moodle, the learning platform used by LSE. That said while there are many systems to set up and apps to download, it was reasonably straightforward. In some ways it was easier for me as many of my fellow students are from overseas and have to overcome jet lag, cultural differences and extra admin such as setting up bank accounts. I had anticipated getting stuck into my reading list this week but to be honest I haven't found much time for reading. I was also hoping for a restful weekend watching the Ryder Cup but I see there is advanced reading for my lectures which start on Monday. So I will leave this post here and make a start.